vonblum::barcelona::breakfast::design::lunch::coffee::inspire: "Isn't she lovely like purple rain...."
Talking with a friend in Brasil, she mentioned listening to a song and always thinking of us. Unfortunately I couldnt even find a link to share it with you but it will surely be added to the vonblum playlist. One thing lead to another and finally of course to a craving for the fruit. 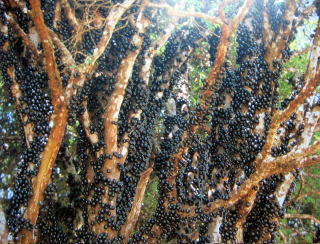 The Jabuticaba (also called Brazilian Grape Tree, Jaboticaba, Jabotica, Guaperu, Guapuru, Hivapuru, Sabara and Ybapuru) is a fruit-bearing tree native to Brasil. The fruit is purplish black, with a white pulp; it can be eaten raw or be used to make jellies and drinks (plain juice or wine). The fruit tree (named jabuticabeira in Portuguese) has red leaves when young, turning green posteriorly. Its flowers are white and grow directly from its trunk. vonblum would love a jabuticaba tree, so we could pick them add them to one of our recipes and we all would rejoice on its sweet taste.